Although 75% of a normal liver may be resected with a reasonable expectation that enough hepatic function will remain to support regeneration of the hepatic remnant, this percentage is significantly reduced when the liver parenchyma is diffusely diseased. A larger hepatic remnant will be necessary to support regeneration and reduce the risk of fulminant hepatic insufficiency. Typically, when more than 50% of the functional capacity of the liver is removed, the possibility of liver failure becomes a threat. For these reasons, judgments about the advisability of a major resection are based upon both estimates of the normalcy of the residual hepatic cell mass (e.g., no cirrhosis) as well as how much of the functioning tissue will remain after the resection. For example, a right trisegmentectomy may be done relatively safely for a large tumor that has replaced the right lobe and medial segment of the left lobe because most hepatic function will already have shifted to the left lateral segment. However, if a trisegmentectomy is done for a small tumor that simply straddles the right lobe and medial segment of the left lobe, a relatively large amount of functional parenchyma is sacrificed and the risk of liver failure increases proportionally. Often, the presence or absence of hypertrophy of the putative hepatic remnant can be appreciated grossly either by CT scan or at operation. 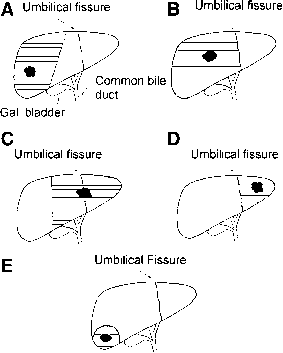 Hepatic resections are frequently termed "anatomic" when an entire lobe (Fig. 3A,C) or segment (Fig. 3D) has been removed, or "nonanatomic" when a piece of liver tissue has been taken without regard for segmental anatomy described earlier. Excisional wedge biopsies of small lesions in the liver are an example of a nonanatomic resection (Fig. 3E). "Extended" resections refer to resections that include more than just a right- or left hemi-hepatectomy; usually another segment. The most common extended hepatectomy is the right trisegmentectomy, which includes the medial segment of the left lobe in addition to the right lobe (Fig. 3B); the left lateral segment (segments 2 and 3) remains. A left trisegmentectomy is harder to perform and is called for infrequently. 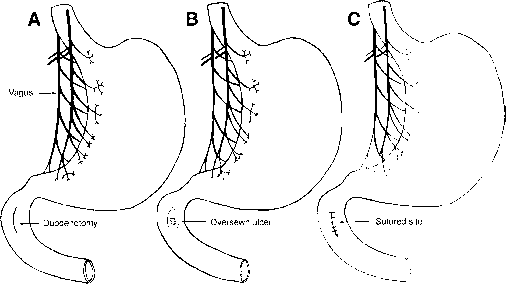 The easiest anatomic resection to perform is a left lateral segment-ectomy (Fig. 3D). For really large tumors requiring an extended resection, the plane of resection is often dictated by the configuration of the tumor. Fig. 3. Anatomical landmarks for hepatic resections. (A) Right hepatectomy. (B) Right trisegmentectomy. (C) Left hepatectomy. (D) Left lateral segmentectomy. (E) Wedge resection.